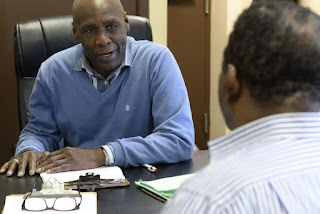 City Mission case worker John Mann works with a client on Smith Street in Schenectady. Nonprofits are not charities that operate like businesses. They are businesses -- fairly similar to for-profit enterprises -- except in their mission and bottom line. And they are just as worried about balancing their ledgers. The prospect of government budget cuts, the squeeze of regulations, growing demand for services that non-profits have traditionally performed and competition for donations all weigh on their budgeting process. That report found nonprofits are an important piece of the area’s economy, with combined 2013 revenues of $9.2 billion, expenditures of $8.9 billion and payroll of $3.1 billion. The 79,210 paid employees of Capital Region nonprofits far surpassed the next-largest employment sectors: local government (57,193), retail (56,525) and state government (50,404). The nonprofit sector added 12,834 jobs from 2003 to 2013. Combined, all other sectors showed a net increase of 1,310 jobs, the study found. The Capital Region report was written by Lester M. Salamon and Chelsea L. Newhouse. It defined the Capital Region as Albany, Columbia, Greene, Rensselaer, Saratoga, Schenectady, Warren and Washington counties. It was created with support from the New York Council of Nonprofits, the Capital Region Chamber, The Community Foundation for the Greater Capital Region, MVP Health Care and The Schenectady Foundation. The chamber got involved at the request of the Tech Valley Nonprofit Business Council, one of the chamber’s internal groups. Eagan said the nonprofit sector spans the economic spectrum, from GED jobs to PhD jobs, because it encompasses everything from homeless shelters to hospitals and colleges. It is also a big part of the cultural landscape. Finally, Eagan said, nonprofits provide much of the safety net for people who are struggling in some way. “Those are all the strengths,” he said. Balancing those benefits is the fact that smaller nonprofits pay their employees lower wages, on average, than government and for-profit employers. Also, their facilities are tax-exempt. "One of the challenges is that nonprofits don't pay property taxes. That does create stress for the cities that host the nonprofits,” Eagan said. Whether the services nonprofits provide exceed the value of the taxes they don't pay is a question that has long been debated. The answer is yes, in Eagan’s opinion. Robert Carreau, executive director of the Schenectady Foundation, said the Johns Hopkins Center report provides valuable insight to the economics of the nonprofit sector. His only wish is that the report had differentiated among classes of nonprofits. It offers no distinction between the hospital employing thousands of people, many at high salaries, and the shelter organization with a few dozen employees, many earning near-minimum wage. "Hospitals and large organizations are lumped in with [Schenectady Inner City Ministry] and small organizations,” said Carreau. The pressures and challenges facing nonprofits vary by their size, but the work they do is equally important to the people they serve. This contributes to stagnant wages and trouble recruiting and retaining employees, he said. The employee turnover, in turn, erodes the interpersonal relationships important to nonprofits, as they collaborate to resolve problems. For that reason, a growing role of the Schenectady Foundation is problem-solving, Carreau said, especially by forming groups with common issues, so they can search for solutions. The Schenectady Foundation distributes $1.3 million to $1.5 million a year to nonprofits. Michael Saccocio, CEO of the City Mission of Schenectady, said the mission operates entirely on private funding but isn’t immune to cutbacks in government funding. When public funding disappears, the organizations that count on those funds turn to the same finite sources of private dollars on which the mission relies. The mission is a business, he said, very similar to for-profit companies except in two important ways: It doesn’t pay property taxes, and its bottom-line definition of success is serving a needy population, rather than turning a profit. Like for-profit businesses, the mission hires vendors and contractors, invests in the community, and employs about 100 people who pay payroll taxes and contribute to the Social Security system. It pays water and sewer fees to the city and forwards sales tax to the state from its thrift store. “Other than the property taxes, it’s very similar” to any other business, Saccocio said. He said the Mission doesn’t have the same challenges hiring people that some nonprofits do -- except for the overnight shelter shifts, which are harder to fill. The satisfaction in helping struggling people get back on track goes beyond the paycheck, Saccocio explained, and that is what draws job applicants. The Rev. Phil Grigsby, executive director of the Schenectady Inner City Ministry, finds the increasing focus by donors and regulators to be problematic, at times. After awareness grew of telemarketers siphoning a huge percentage of donations for some charitable operations, everyone wanted to know how much their nonprofit was spending on administrative and fundraising costs. SICM runs lean, Grigsby said, with only 10 to 20 percent administrative overhead, depending on the details of a particular program. SICM’s summer lunch program, which boosts the organization's staff from 10 to 50 for the season, is a major undertaking, involving much more than rolling up to a playground with a cooler full of sandwiches. “To run that program, you have to have a very skilled financial person on board,” Grigsby said, adding that it also takes a dedicated program director. “It requires a certain level of administrative capacity," he said. With their money, donors are providing more than 2,000 lunches on summer weekdays to children who, during the school year, rely on school districts' free meal programs. “We’re not doing that program to make money,” Grigsby said. To fund its $2 million annual budget, SICM relies on a variety of sources. Grigsby said he’s concerned that the conditions of the 2008 economic downturn -- greater demand for services and less funding for them -- will repeat and pinch SICM's funding sources. “From our point of view, we’re anticipating that,” he said. The United Way of the Greater Capital Region is seeing that trend already, Executive Director Brian Hassett said: Its annual campaign is wrapping up, and is short of its target. The United Way funds 60 organizations and partnerships that serve more than 100,000 people a year, so Hassett has a direct view of the landscape described in the Johns Hopkins report. “In many ways, it tells a very powerful story,” he said. The Capital Region has a major asset for nonprofits in its stable and diverse economy, Hassett said. But parts of that economy, particularly technology firms, aren’t as supportive as established companies. The GE Family of Givers, for example, is the largest single donor to the United Way of the Greater Capital Region and is attached to one of the region's oldest corporate residents. Many are food banks, homeless shelters, community centers, and other organizations that help the working poor, a demographic that increasingly seeks assistance. “We’ve been trying to shed light on this segment of the community,” Hassett said. The nonprofit sector added 12,834 jobs from 2003 to 2013 in the Capital Region. Combined, all other sectors showed a net increase of 1,310 jobs. Nonprofits employ 16 percent of the region’s total workforce and 21 percent of its non-governmental workforce. Nonprofits had assets of $13.8 billion, revenues of $9.2 billion, expenditures of $8.9 billion and wages of $3.1 billion. The bulk of the region’s nonprofit employees, 48,902, work in health and social services. The average monthly wage was $3,288 for nonprofits, $3,821 for local government, $3,968 in the for-profit sector and $5,221 for state government. Congress is seriously considering legislation to repeal or significantly weaken the longstanding law that requires 501(c)(3) nonprofits to be nonpartisan (sometimes called the "Johnson Amendment"). Politicizing 501(c)(3) organizations would damage the public's trust in the work of nonprofits and would take money away from nonprofits' mission-related work and put it into the hands of politicians. Now is the time to take action to prevent this from happening. Please take two minutes today (March 31st is the deadline!) to sign your organization onto the Nonprofit Community Letter in Support of Nonpartisanship. It is essential that as many nonprofits as possible sign on to this letter, since our members of Congress will take our concerns more seriously if they see a strong and united nonprofit sector. Thank you if your nonprofit is one of the 250+ organizations from New York State that has already signed on to the letter. To learn more about why this proposal is such a threat to nonprofits, check out the recent op-ed in The Hill (an influential publication on Capitol Hill) from the National Council of Nonprofits and the Council on Foundations. Please spread the word to other nonprofits. Feel free to forward this action alert to other nonprofits, foundations, and religious institutions. At NYCON, March Madness starts us thinking about our own Big Event...Camp Finance 2017! This year is our 16th Annual Camp Finance and we look forward to seeing you at Mohonk Mountain House on October 5th & 6th. To capture the excitement of both events, we're offering you our March Madness Camp Finance Discount from now until Midnight on April 3rd. You can save $30 on Full Conference Camp Finance rates. While we are finalizing themes, workshops and speakers for 2017 we want to make sure you - the people who are "mad" about Camp Finance- can save money! From March 27th until April 3rd receive a $30 discount on Full Conference registration for Camp Finance. Just click here and enter discount code 17MADNESS. This all inclusive Full Conference rate covers the workshops, meals and your overnight stay at the lovely Mohonk Mountain House in New Paltz, NY on October 5th & 6th.